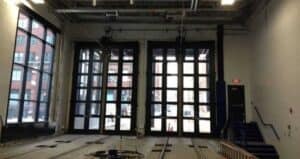 Bi-fold doors, also referred to as four-fold doors are an ideal choice when side space is available and there is a need for long lasting, low maintenance doors. 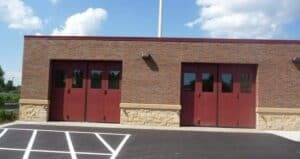 With no springs to break and jamb the door, the bi-fold’s design is ideal for high cycle environments such as fire stations, parking garages, and auto dealerships. Bi-fold doors often open faster than a conventional overhead door. Bi-folds operate at typical speeds of 24 inches per second compared to operation speeds of 8 to 12 inches per second for other door styles. A 14’ x 14’ bi-fold takes less than 7 seconds to open! For larger door openings and vehicles, the faster speed allows more vehicles to move through the opening. Because the door closes quicker, there is less opportunity for intrusion and less air loss; an important consideration for our harsh Minnesota winters. The bi-fold door moves horizontally rather than vertically, making the door visible throughout the opening motion, and giving the diver a better view of the door clearance. With overhead doors drivers can misjudge the clearance available and drive into the bottom of the door as it is opening. In addition, bi-fold doors are more tolerant of dents and dings from impact in that the door will still continue to operate. In need of a bi-fold door for your facility, but not sure exactly where to start? Save time, and let us do the work for you by giving us a call at (651) 683-0307. With a few simple questions, one of our experienced Sales specialists will be able to help you select the bi-fold that best fits your environment. 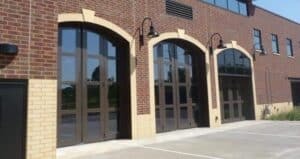 On the other hand, if you know exactly what you are looking for in a sectional door, you can review exact door specifications at Door Engineering’s website. Bi-fold door sizes range from 7’ x 7’ to 24’ x 24’, with larger sizes available for special applications. Since no springs are required, the Bi-fold door’s manual operation is quick and easy with the simple pull of a cord.